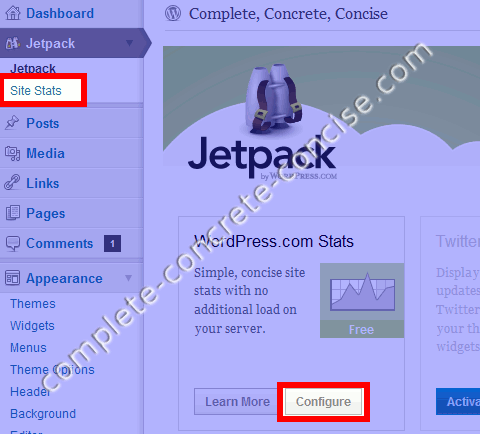 I have the Jetpack plugin installed and use the Stats module in it to monitor activity on this site. Keep in mind we don’t count your own visits. Unfortunately, this is not completely true – if you are not logged in, it will count your visits to your site. This is rather disappointing – I imagined they would be using a cookie to track my visits and, thus, ignore them. At least it explains the sudden “surges” I sometimes saw – it wasn’t other visitors, it was me. 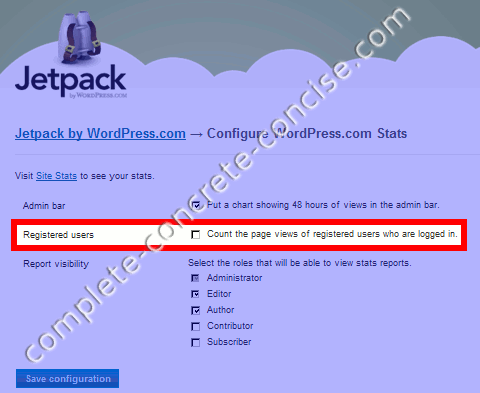 Thanks to commenter Brad for informing me about the tracking option in the Site Stats configuration. Not a big issue, since I use Google Analytics as well, but the WP/Jetpack graph would be handy to quickly tell current visits. Interesting. I wonder why that is? Maybe I’ll investigate it further when I come back from holidays. It seems obvious they are not using a cookie to track users. Maybe if you are running your browser in “private” mode, it fools Jetpack into seeing other browser sessions as not belonging to you. I use Analytics as well, but Jetpack is nice to get a quick overview of what’s happening without having to log into Analytics. I just read this article. Good Post. Read the comments, and I just found out, in the JetPack Config, that if the “Count the page views of registered users who are logged in” box is check, then YES it will count your views too because your “Admin” and your a logged in User. Thanks for that reply. You’re right, there is an option box to “count registered users”. I enabled the jetpack stats about 2 weeks ago and then Google Analytics about 2 days ago. There seems to be quite a difference in them. In regards to the number of views that jetpack displays, I’m guessing that’s not unique users but instead how many different pageviews have taken place on your site. If someone comes in on the homepage, reads a blog post, back to home, reads another post is that 4 views? Either way I guess Google is the better of the 2 but even in total pageviews, jetpack seems to be about 20% higher. Which one should I believe? Correct, Site Stats gives the number of page impressions – which will be higher than the number of visitors. Analytics reports the number of visitors. However, Analytics can also report the number of page views. Go to Audience -> Behavior -> New vs Returning” above the graph you will see the number of visits and the number of pages per visit (in my case it is about 1.25). Go to Content -> Site Content -> Pages and above the graph you will see: (1) total page views, (2) unique page views (some people might come back for a second or third look at a page). The difference between the numbers is gets even more complicated if the Analytics and your WordPress times zones are different. For example: in my case, it seems that Adsense is using Pacific Time and Analytics is using Eastern Standard Time. I have my site’s times set to Pacific Time so it more closely corresponds with Adsense statistics. In general, both graphs should look reasonably similar – I don’t worry too much about the numbers. Thanks for the quick reply. I still don’t understand why the WordPress page views are higher than Google but it may be like the Tootsie pop question, the world may never know. I guess I’ll follow the Google stats more closely since it gives so much more information. I did learn something else. I happened to have the realtime trend up and it took 12 minutes from the time you viewed my wife’s site before it showed up in the standard reporting. As mentioned, the difference may be down to the time zone of your WordPress site and the time zone Analytics is using. Alternatively, it might be that Google doesn’t count certain visitors (like robots or spiders crawling your site or bots trying to leave SPAM comments). Yeah, in the Internet world, realtime has a somewhat different meaning from expected usage. I take the numbers with a grain of salt. I use it to gauge if the number of visitors is growing, stagnant or diminishing and working out the relative popularity of one article vs another.